Just because the screen on your phone is tiny…doesn't mean the controllers you use to play your smartphone games has to be, too. Fans of old school gaming consoles and gamers who just want more playability will appreciate the advantages of this wireless mobile gaming controller, available now for only $52.95 (regularly $99.95). The premise is simple: just slip your smartphone or tablet into the clamp on this heavily Xbox-inspired controller, sync 'em up via Bluetooth, and you've instantly got a ton more mobility and functionality than you would ever have playing on your phone's touchscreen. With the controller's full-size multi-button layout, you'll be able to attack your games with a full range of motion, maneuvering joysticks, triggers, and button arrays. Breaking away from simply using index fingers on a touchscreen will have you landing high scores on all your favorite mobile games in no time. You can use the gamepad in four different modes (gamepad, keyboard, touch, and arcade), and even connect the whole package to your TV through Airplay to play all your mobile games on the big screen. 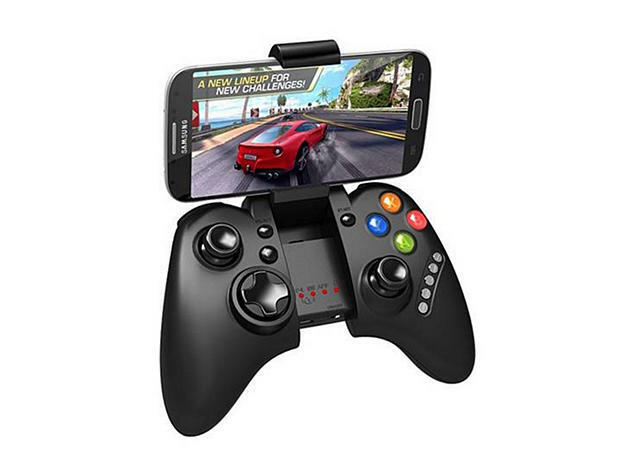 Take your phone games to a new level with this wireless mobile gaming controller, now 47% off its regular price with this limited time deal.